Each Gypsy Glass Bead Bracelet is truly unique and an essential conversation piece. 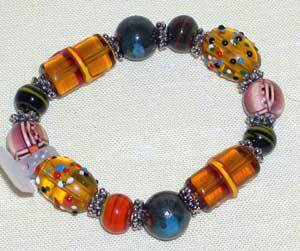 Made of Vivid ornate glass beads, on clear elastic, we will be sure to have a color to compliment any ensemble. Cobalt, Turquoise, Amber, Lavender, Green, Red. Designed by Carolyn Forsman.